Upgraded for 2016, the Fenix RC40 rechargeable LED flashlight now blasts an incredible 6000 lumens ultra-long distances of up to 2,395ft. Dual side switches control the five output modes, strobe and S.O.S. The built-in rechargeable Li-ion battery pack, plus charging and discharging port with protective circuit, make it super efficient in battery charging, and also enables it supply power for other digital devices. The Fenix RC40 Rechargeable LED flashlight is an invincible companion when the ultimate power in lighting is needed. With the light off, press and hold the master switch for 0.5 seconds to enter into General mode, press and hold the auxiliary switch for 0.5 seconds to enter into Strobe. With the light on, press and hold the master or auxiliary switch for 0.5 seconds to turn off the light. In General mode, click the auxiliary switch to enter into Strobe. In Flash mode, click the master switch to enter into General mode. In General mode, click the master switch to cycle through Eco→Low→Mid→High→Turbo. In Flash mode, click the auxiliary switch to cycle through Strobe→SOS. The flashlight remembers the last brightness level used in the General mode, the next time it is turned on, it will recall that previously used brightness level. Lock: Simultaneously press the two switches for 3 seconds (when the light is unlocked), the light will blink twice at Low and then go out. Note: In locked state, the light only responds unlocking operation, press on any switch, the light will blink twice at Low to remind the light is under locked state. The light will accumulate a lot of heat when it is working at Turbo or High output levels. When it is detected at 65℃ or above, the light will automatically and gradually lower the output to prevent overheating. The brightness will automatically return to the normal level if the light is detected below 65℃. There are four LED indicator lights at the tail of the flashlight. Click the round tail switch the indicator lights will be on for three seconds. The more indicators are lit up, the more battery power will remain. Like this, four indicators illume indicating at least 80% power remaining, one illumes indicating more than 20% remaining, and one flashes indicating 20% at most. When the battery voltage is extremely low, the light will turn off automatically to protect the Li-ion battery from being damaged. When the voltage level drops below the preset level, the flashlight is programmed to downshift to a lower brightness level until to the lowest output to remind you to recharge the flashlight. To ensure normal use, the flashlight will not turn off automatically until Over-discharge Protection stops the battery from working. Plug the power adapter into an electrical outlet and confirm the LED indicator on the power adapter is solid yellow. Uncover the round charging port of the flashlight tail and connect it to the power adapter. Then the four blue indicator lights at the tail of the flashlight flash clockwise, indicating the charging process has begun. All the four blue lights turn solid when charging is completely done. The normal charging time is about 3.5 hours. Connect other device to the USB port of the flashlight. Then press and hold the round tail switch for one second, the four blue indicator lights start to flash counterclockwise, indicating the discharging process has begun. The max loading capacity is 5V/1.5A. Once charging is completed, be sure to plug the anti-dust covered. Charge the light when it is off to permit full and fast recharging. When charging and discharging is simultaneously detected, charging is prior to discharging. Please recharge a stored RC40 every four months to maintain optimum performance of the battery. love this powerhouse! this lives in our camper and when it comes out it never fails, someone asks me where did you get that!?!? up at camp we have a 2 mile stretch of logging road and its almost strait. lite this bad Larry up and you can see everything! uising the built in use charger to power up cellphones is also a cool feature. only thing i would change is just having one power button in place of the 2 buttons side by side. maybe putting the power output mode button out back near the battery indicator button, or incorporate that into the indicator button. my daughter always messes up my setting when she uses it. watching her and other people use it can be quite comical. i usually get it back on strobe mode “here shut this thing off i cant” still giving it 5 stars tho. things a beast! unreal how bright and powerful this flash light is……It comes in a nice case …Its so powerful it almost looks like u can hit mars with it……….the martian the movie he could have really used it to survive on the red planet……. 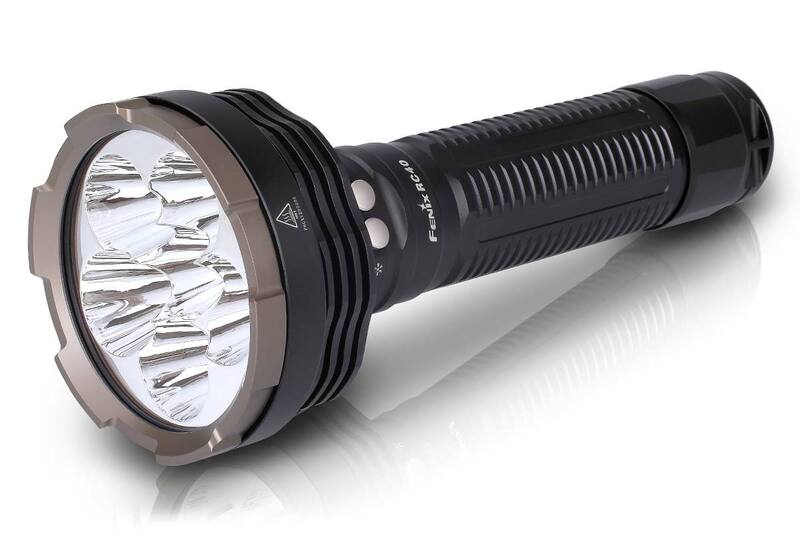 Good runtime extreme performance flashlight….so heavy, but strong and easy TO charge! Check battery level on the tail cap and 5 intensity Light levels + strobe mode. Last week was the 1st anniversary or my rc 40…….i’m a farmer , i use my flashlight for wild animals control and House safety at Night. Like a little Sun in my hands !..nobody escape TO the rc40 jet beam!! Own the night. I use it for alligator hunting at night. It has the power and throw to reach across the swamp or lake I’m hunting, the durability to take the hard knocks, and the runtime to last all night long. It’s nice to be able to take just one light hunting at night, instead of the 3 or 4 I used to go through in a single night. just bought this light last week. some of my buddies n I have started bowfishing at night. I started looking on line for the brightest flashlight I could find. when I found this light I was a little leary of the price but we had been using lights that use the cr123 batts and at close to ten dollars a piece its not gonna take long to make up for the price of this light. and by the way when I jump up on the rock beside one of my buddies they just turn their light off. cause its just embarrassing. lol. this is the bad assest light money can buy!!!! !